Earthenware circular saucer, 'falcon' shape. Decorated with transfer-printed design of pink stars. This was one of the most commercially successful of Susie Cooper's pre-war designs. See C.6:1 to 16-1993. Shown in the Exhibition "British design at Home", April-Sept 1994, Japan. Susie Cooper Pottery had a huge impact on tableware by the late 1930s. By smartly decorating modern shapes, Cooper targeted a particular middle-class market who appreciated the current vogue for stylish designer tableware but had limited purchasing power. Her services were designed with economy in mind: earthenware is a cheaper material to produce than bone china. At this time most middle class households would have aspired to a bone china dinner service but Cooper made earthenware a desirable alternative. Cooper services were very popular as wedding gifts for smart young couples setting up home for the first time. 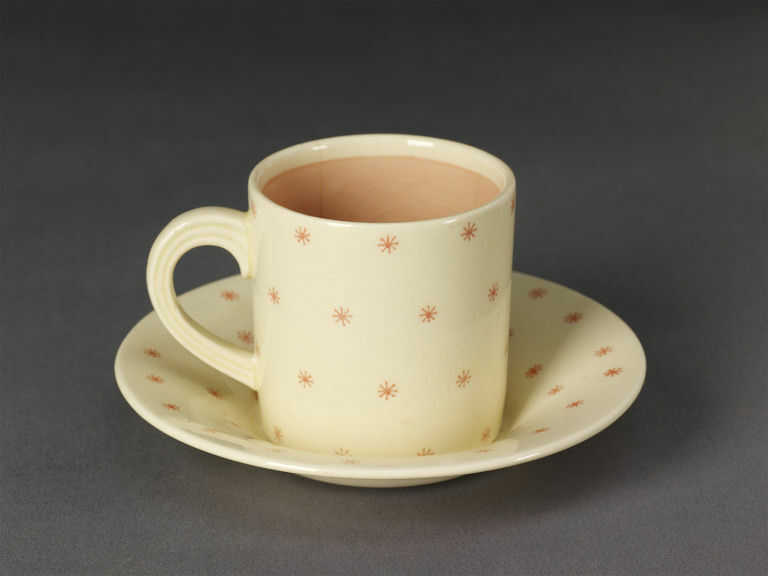 This star design is a later and slightly altered version of Cooper's painted Polka Dot design, which was one of the most popular patterns for Susie Cooper services in the 1930s. Cooper introduced Polka Dot in 1933 because it could easily be hand-painted by her assistants. In 1935 she introduced lithographic transfer printing, an even simpler process, to help meet the growing orders from her suppliers who included major department stores like John Lewis, Peter Jones, Harrods, Selfridges, Heal's and Waring and Gillow. Cooper continued to produce popular patterns such as this well into the 1950s. 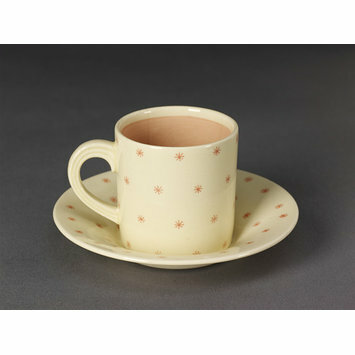 Bone china versions were produced in the 1950s: an interesting inversion of the original aim of her work. Saucer, 'Falcon' shape, part of a coffee service, designed by Susie Cooper, made by Wood & Sons Ltd., decorated by Susie Cooper Pottery, England, ca. 1939. Eatwell, Ann Susie Cooper Productions. V&A Museum, 1987, cat. 161 and 162.